Flowers are always beautiful. No matter what season it is you can always draw inspiration from their beauty and they tend to go along with every outfit! Another great thing about florally inspired nails is that they always seem fresh looking and are always trending. So no matter what season, day or year you can always look like you know what’s going on with them. Here are some classic and trendy floral nail designs that you can’t go wrong with! In fact, you might even say that they will grow on you forever. Peachy Flower nails are wonderful because even though they are peach they tend to go with everything you could wear. They have a slight hint or pop of color but are very neutral. Think of a pinkish tope color with some jewel or gem flare. This tutorial will show you exactly how you can get these nails and just how fabulously perfect they are. 3D floral nail art is something that has become increasingly trendy over the past year. This is mainly for acrylic nails so if you don’t have acrylic nails you might not try this look, but if you are one for trying the acrylic nail look then these are gorgeously perfect for any occasion. I would even recommend them for a wedding. Just stick with a white flower look and a hint of glitter as you can see in this tutorial here. Cherry blossom nail art is another trending look. Everyone wants to have the floral with some slight Asian inspired flare. Cherry blossoms are perfect for that. To get the perfect cherry blossom nail look can be a little difficult so it’s important if it’s your first time creating this look that you go off a tutorial. While it doesn’t seem like they would be too difficult to do it can get quite complex. So just be aware of this before you start your cherry blossom nail art venture. Here is the tutorial I recommend. Looking for a quick and easy floral nail art inspiration? Look no further than these cute cartoonish looking flowers. They are still elegant enough to be on adult nails, but cute enough to be easy to do. Check out the tutorial here. You will never be disappointed with these beautiful nails. Real flowers are a newer trend to put inside coffin nails. These acrylic nails can have real flowers placed inside. Again this sort of nail art would only be for those who have fake nails. If you have regular nails that you simply want to paint there are plenty of other choices within this article for them, but these are pretty cool to look at. The process isn’t only soothing to watch, but extremely fascinating. So take a look at the tutorial right here. Floral doesn’t just mean flowers. Clearly, we have been paying close attention to flowers on this list, but these elegant nails are perfect for any season and you will find them rather relaxing to look at. There is always something relaxing about bamboo in general. The idea of a beautiful bamboo forest is peaceful and you can get this look on your beautiful nails too. Whether they are acrylic or not your nails will look simply elegant with the beautiful soothing green colors and the bamboo shoot pattern. Plus, it goes rather well with any outfit and makes a fashion statement that’s simply Zen. To check out the easy to do bamboo nail art and give your nails some Feng Shuai go here. 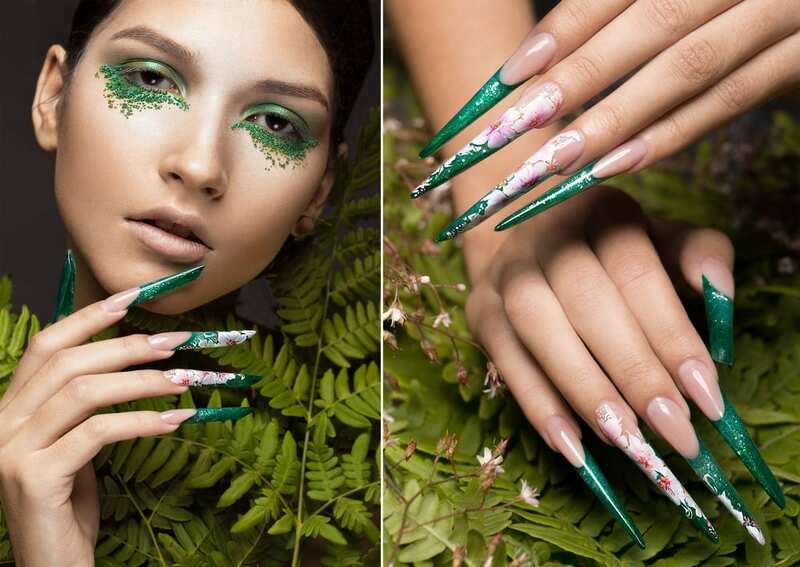 Fern nails are a huge trend right now. Especially during the Fall and Winter months ferns always seem to have that extra glimmer for nail art trends. Why? Well perhaps it’s because ferns are dark green and dark green is a color that screams the Fall and Winter season. I’m not sure, but either way, these nails are simply elegant and a must-do whether you’re going to a party or going to work. Here is one of my favorite fern nail art tutorials. I hope that you will enjoy it as much as I do. Looking for a funky floral look? Look no further than funky flower nail art. Not only is it easy to do, but it’s super fun and a fun look. You can be a hippie or a serious businesswoman and still rock these funky nails. Use bright colors and a unique design or pattern to make the look complete. Oh, and you can do them with any bright colors you choose! The design is really the important part of this entire funky flower nail art style. Flowers will always be a classic nail art pattern. It will also always be a trend that is constantly changing. The great thing about nail art is that you can use it to express your personality and your style at every different point in your life. This is that same for flower nail art because you can always tweak or change the above styles to match your own. As always, be creative, be bold and be true to yourself.